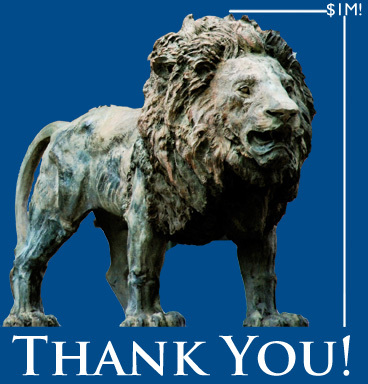 Thank you to the more than 2,050 Columbians who made a gift in April and met the challenge of A Million Reasons to Give! Your efforts earned the full $1M matching gift to the Columbia College Fund, and showed the collective generosity of our community. For generations, Columbians have been creating their own reasons why they love Columbia College. Whether you have fond memories of late nights in Butler, bonded with your closest friends debating Dante in John Jay, or remember your first steps onto College Walk, your time in Morningside Heights left you with a lifetime of reasons to give back to alma mater. The challenge is over, but you can still make your gift today! Gifts to the Columbia College Fund bolster all aspects of the undergraduate experience. Your generosity will enhance financial aid, provide the resources necessary to maintain Columbia’s renowned Core Curriculum, support improvements in student services and support summer internship stipends. Alumni support of the College Fund has made possible enhancements to Columbia’s academic and student programs. "Return of the Sun Bear"